The discovery team says it might have used its horn as a paddle to sweep snow from vegetation. A woolly rhino fossil dug up on the Tibetan Plateau is believed to be the oldest specimen of its kind yet found. The creature lived some 3.6 million years ago – long before similar beasts roamed northern Asia and Europe in the ice ages that gripped those regions. The discovery team says the existence of this ancient rhino supports the idea that the frosty Tibetan foothills of the Himalayas were the evolutionary cradle for these later animals. The report appears in Science journal. 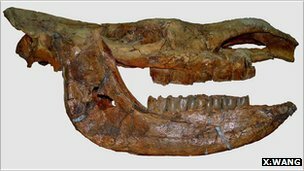 “It is the oldest specimen discovered so far,” said Xiaoming Wang from the Natural History Museum of Los Angeles County, US. “It is at least a million years older, or more, than any other woolly rhinos we have known. 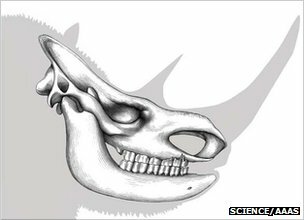 “It’s quite well preserved – just a little crushed, so not quite in the original shape; but the complete skull and lower jaw are preserved,” he told BBC News. The rhino was found in Tibet’s Zanda Basin. The area is rich in fossil beds, and this specimen was unearthed along with examples of extinct horse, antelope, snow leopard, badger and many other kinds of mammals. It has been put in a new species classification – Coelodonta thibetana. Dr Wang and colleagues say it displays some very primitive features compared with its counterparts that lived through the later great glaciations of the Pleistocene Epoch. Judging from marks on the skull, the creature’s horn, which has not survived, would likely have been quite flat in construction and leaning forward. This might have allowed the animal more easily to sweep snow out of the way to get at vegetation, a useful behaviour for survival in the harsh Tibetan climate, the team says. “We think it would have used its horn like a paddle to sweep the snow away,” Dr Wang explained. Although the extinction of the Pleistocene beasts, such as woolly mammoths and rhinos, great sloths and sabre-tooth cats, has been intensively studied in recent years, much less is known about where these giants came from and how they acquired their adaptations for living in a cold environment. The argument made in the Science paper is that perhaps they got those adaptations on the Tibetan Plateau. “When this rhino existed, the global climate was much warmer and the northern continents were free of the massive ice sheets seen in the later ice ages,” Dr Wang said. “Then, about a million years later, when the ice age did hit the world, these Tibetan woolly rhinos were basically pre-adapted to the ice age environment because they had this ability to sweep snows. The Los Angeles-based researcher concedes that many more fossil finds will be required to underpin the Tibetan hypothesis. Andy Currant, an expert on the Pleistocene (1.8 million to about 11,000 years ago) at London’s Natural History Museum, says this is not straightforward in the case of woolly rhinos, and good specimens can sometimes be hard to come by. “Woolly rhino were preyed on by spotted hyenas and they were eaten pretty thoroughly; the hyenas liked the bones,” he told BBC News. The remarkably clever dolphin has amused us with its tricks and intrigued us with its intelligence, and now it turns out that it routinely defies death. It can ignore a wound that would kill a human within hours. Dolphins, according to a new study, are frequently attacked by sharks that leave gaping holes bigger than a basketball. Zasloff thinks he may have at least partial answers to those questions, although much more research needs to be done. “I have concluded that what we see when we look at the dolphin is a medical miracle,” he said in a telephone interview. And if scientists can figure out exactly how the dolphin cheats death, maybe humans can eventually learn how to do it too, through better treatment of all sorts of injuries, not just shark bites. Zasloff is a surgeon, not a dolphin expert, but his interest in this sea-going mammal began nine years ago when he was visiting a marine lab in Scotland. He was told that 70 to 80 percent of the dolphins that swim in the waters near Australia have shark bites. A shark bite involves more than just ripping out a large chunk of flesh. The shark leaves “the worst collection of toxic organisms” in the wound, so infection should follow. A human being would die of infection and shock within two or three days if not hospitalized. So how does a dolphin heal itself without medical treatment? That question haunted Zasloff for nine years, but a few months ago, he began working with Australians who are in constant contact with bottlenose dolphins, including Trevor Hassard, director of the Tangalooma Wild Dolphin Resort on Moreton Island. The resort is different from most aquatic parks in that the dolphins are free to visit, where they get an easy meal, or leave and return to the wild whenever they so desire. Over the years Hassard and others who care for wild dolphins have seen hundreds of dolphins that have been attacked by sharks. If the attack was recent, an open wound, usually on the backside of the dolphin, seemed to have little effect on the animal. It swam normally, did not show any sign of pain — though dolphins clearly can experience pain — and acted as though nothing was wrong. And within about 30 days the wound was gone. There were no scars. No signs of the injury. Even the natural contour of the body was back to its normal shape. It’s not even officially ‘summer’ and we’ve already seen temperatures above 100 degrees for several days. This is not good news for our furry friends and there have already been numerous injury reports regarding pets left in cars. Short hair, long hair, thick or thin hair doesn’t matter. Our pets are wearing fur coats 24/7. Fido, Fluffy, Smokey and Rex are at least 10 times hotter than any human in this heat, with less ability to fight off the heat because they can’t sweat. Heat exhaustion in pets is very dangerous, and can be fatal. With the hot weather here to stay, we’d like you to help us spread the word and these “Hot Weather Tips” to help folks keep their cats and dogs cool and safe during this hot weather. Never leave your pet in a parked car – cracked windows will not protect your pet from overheating in the car. Even with windows down, temperatures rise quickly inside and a car can be 25 degrees hotter than the outside temperature. Provide plenty of clean, fresh water at all times, change water daily. Exercise your dog in the early morning or evening hours. Avoid exercise during the hottest part of the day. Hot pavement can mean hot or burned paws, avoid walking your dog on hot pavement or roads. Since many people treat their lawns with pesticides at this time of the year, keep your pet away from unfamiliar yards and grassy areas. Grooming is a must, but do not shave off all your pets’ hair – his coat will protect him from getting sunburned. Steer your pet clear of puddles of auto coolant in the garage or driveway. This liquid tastes sweet and is tempting to animals but is poisonous and could lead to a fatal result. Pets should ride inside the car, not in the back of an open vehicle where they are subject directly to the elements as well as run the risk of bouncing or falling out. If your pet must travel in the back of an open vehicle, make sure he’s safely tethered to the center of the bed where he’s unable to reach the sides and is able to stand or site on a slip-proof and cool surface. Heat stress can be fatal – Get your pet to a veterinarian IMMEDIATELY when you see these symptoms.